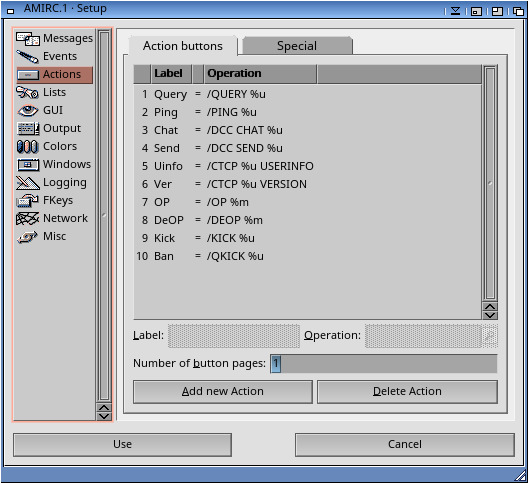 Description: AmIRC is the best client for the IRC Internet Relay Chat protocol written by Oliver 'Olli' Wagner. Oliver Wagner <owagner@vapor.com> and Jamie van den Berge <entity@vapor.com>. 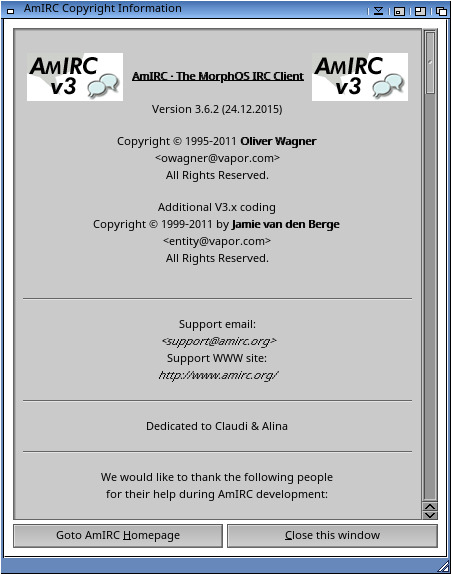 AmIRC used to be shareware. It is now FREEWARE! No key is required anymore. The new official AmIRC website is http://www.amirc.org/. 3.0 or OS 3.1 systems, one for PowerPC CPUs and MorphOS. Special thanks to all ATO members who provided translations for AmIRC. drop sending of files, and DCC RESUME. is an option to automatically accept DCC CHAT connections. - Supports secure encrypted DCC CHAT (SCHAT). - Internal CTCP flood and DCC bomb protection, and clone warning. - Full Undernet IRC extensions (reply codes and additional commands). - Intuitive channel display, with userlist and channel mode overview. - Uses query windows for private chat. - Easy to use command line aliasing. - Nickname notification, highliting, ignoring and kickban. deiconify, or ARexx scripts to certain events. MSGs to, received MSGs from or addressed publically with "nick:". (e.g. /MSG, /OP, /DEOP), for automatic expansion. - Auto rejoin channel on /KICK, and auto reconnect to server facility. 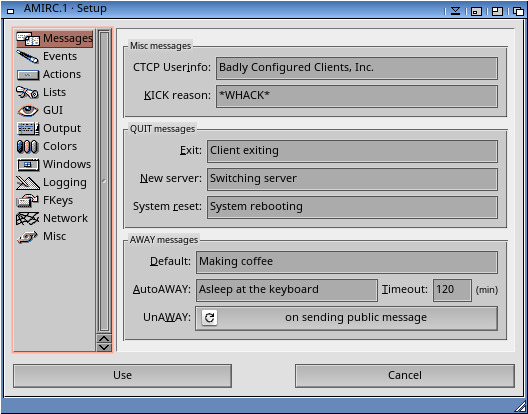 sending public and/or private msgs is possible. - UPnP port forwarding for DCC and IdentD. - Turbo and Passive DCC support. to leave more visual space for topic. changes list below for details. duplicate ASLFR_InitialDrawer tags in the final tag list. userhost cache and get the window info filled. - GUI: dialog windows now have an "I"gnore button. This will (temporary) IGNORE the query window user. - Rexx: added GetTarget command. - GUI: added 'automatic' IRCNet channelmode 'e' and 'I' modebuttons. - GUI: topic no longer changes to editable string when you get voice. - GUI: IRCNet channelmodebuttons really automatic now. - GUI: fixed the userlist gauge. joined channel and 'cycling' & leaving the current channel. pattern (which must be nick!user@host style) specified. all known users instead of just the channel. - DCC: fixed cps calculation for DCC RESUME. - Rexx: fixed cps calculation for DCC RESUME in GETDCC. - GUI: attempts to /QUERY channels will now fail silently. - Command: fixed /OP, /BAN (etc) handling and made it more intelligent. one odf the 'already joined' channels. - GUI: made Query windows prefix use 11 instead of 9 characters. - LOG: added logfilename template configuration options. - Plugin: added AMIPLUG_Query_Hook_Prefs and related stuff. - GUI: set correct background for Setup window. - GUI: removed NList title seperators in Setup->Actions. - GUI: AmIRC logo replaced with V3 logo by Morden. - GUI: removed 'Lists...' and 'Function keys...' items from Setup menu. - GUI: userhosts in WHOIS also no longer turned into URLs. - Command: fixed buffer overflow in /HELP due to too many commands. - GUI: fixed listview images not being allocated in chipmem. - Plugin: hiding the VERSION response should now be harder to do. - GUI: added CTCP flood control settings (in Setup->Misc). - GUI: timestamps can now be disabled, hh:mm, or hh:mm:ss. to resize to the page's maximum size if the window was larger. again with a different userhost. action when clicked (see Setup->Actions->Special). current settings to the new thread. - GUI: DCC windows no longer show a redundant "from" in the host column. - Plugin: Fixed enforcer hitfest when plugin returns NULL in _Setup(). the window & stuff yet. window (default) or uniconify/pop to front (the 'old' way). - Net: fixed ban/invite/exc list messup. - Plugin: added amiplug_fakerawline() function. joining multiple of channels at once. - GUI: fonts used for channel and dialog windows are now configurable. - GUI: added a number of new textcolor configuration options. - GUI: fixed dialog window font not being set/saved. timestamp, and/or inline url mode were changed. - Imported source on CVS. until a line is received from the server. - General: fixed busyloop/crash on selecting "load|save settings..."
- GUI: added 'economy' channelmodes button as option. it saves some horiz. forcing the query to open in a new (-) or the current (+) window. they are switched on/off in Setup window. with the handle positioned at where you dropped it. - GUI: removed "Seperate Userlist" and "Query windows on Public Screen"
channels for people from the notify list. - General: changed the resethandler so Intuition doesn't think AmIRC is crashed. - General: libraries are now closed if something went wrong during inits. - DCC: rewrote the secure chat code in C. Many thanks to Piru, my ASM teacher. - Command: unknown commands are now sent to the server.